Like Platinum, HeartGold & SoulSilver, Black & White features an event that unlocks when you send over certain Pokémon from real-life events. One of these features the Fox Pokémon, Zorua. When you transfer Celebi over from the Generation IV games, you will be able to find two characters in one of Castelia City's gates. 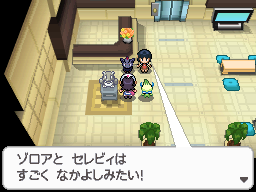 When you talk to the character with Celebi in your party, Celebi will pop out of its Pokéball and Zorua will change from its Illusion. The trainer for Zorua will give you it as a gift due to how well they played together.